My tweep Cris asked for a ham recipe, and here is my fave. Perfect for Thanksgiving if you need a second protein, but also delish for Xmas or Easter. Remove the skin from your smoked ham, leaving about ¼ to ½ inch of fat. Score the fat in a diamond pattern, trying not to cut into the meat. Preheat oven to 350, and line a baking pan with foil or use a disposable foil pan. Place 1 c of water in the bottom of the pan. 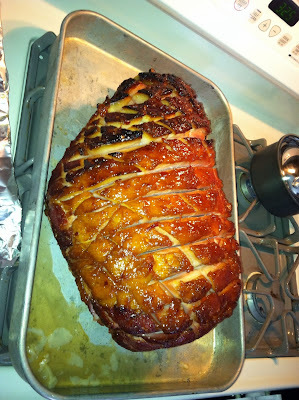 Coat the ham with the glaze and bake until the meat is heated through. Come join me over on Twitter, its a three day prep party!